Feed supplement with calcium, magnesium, vitamin B and propylene glycol for cows and heifers during calving. Liquid feed supplement with calcium and vitamins. For cows and heifers before and after calving. Reduces the risk of calcium deficiency after calving. Rapid absorption through the “Drench”-Method. Increasing the blood calcium level within 15 minutes. No irritation of the oral cavity or the esophagus. No risk of overdosing (absorption via the metabolism). Milk fever occurs in almost every dairy farm on a regular basis. Especially high-performance animals from the 3rd lactation are more susceptible to a calcium deficiency, heifers are less affected. Milk fever can be recognized by inertia, tremors, recumbency, mouth breathing, cold ears, dry nose, significantly increased heart rate and falling body temperature. About 8-10% of all calving cows show signs of clinical milk fever, where on the other hand more than 30% of all calving cows show symptoms of subclinical milk fever. The economic loss of milk fever is valued at 250 € per case. Subclinical milk fever can sometimes cause far more economic harm if late or not consistently acted prophylactically from the 3rd lactation (especially reproductive disorders, retained placenta, uterine inflammation, abomasal displacements and ketoses). AGRIDrench Calcium is a liquid feed supplement for ruminants, which has been designed to stabilize the mineral- and vitamin-keeping around calving. AGRIDrench Calcium contains a rapidly available form of calcium. It goes directly into the abomasum and stabilizes the blood calcium level within 15 minutes. So the risk of calcium deficiency (cause of milk fever) after calving will be minimized quick and easy. In addition to the main component (calcium) AGRIDrench calcium also contains minerals (e.g. magnesium and potassium) and vitamins. To name in particular the vitamin B complex, which stimulates the appetite and thereby boosts and stabilizes the metabolism of the cow. AGRIDrench Calcium can be used as support in case of a risk of milk fever, abomasum displacement, retained placenta (after birth). AGRIDrench Calcium is fed with the aid of a drenchgun. Thereby the tube must be placed as far back in the cheek pouch as possible (between cheek and molars) and the liquid must be administered slowly. Give the animal the possibility to swallow. This drench method ensures that the cow does not taste the liquid and it eliminates the risk of choking. Please ensure that there is a swallowing reflex! AGRIDrench Calcium is fed in portions of 200ml. From the 2nd lactation, it is recommended to give 2 portions (1 portion before and 1 portion after calving). If necessary, you can give additional portions at intervals of 6-8 hours. 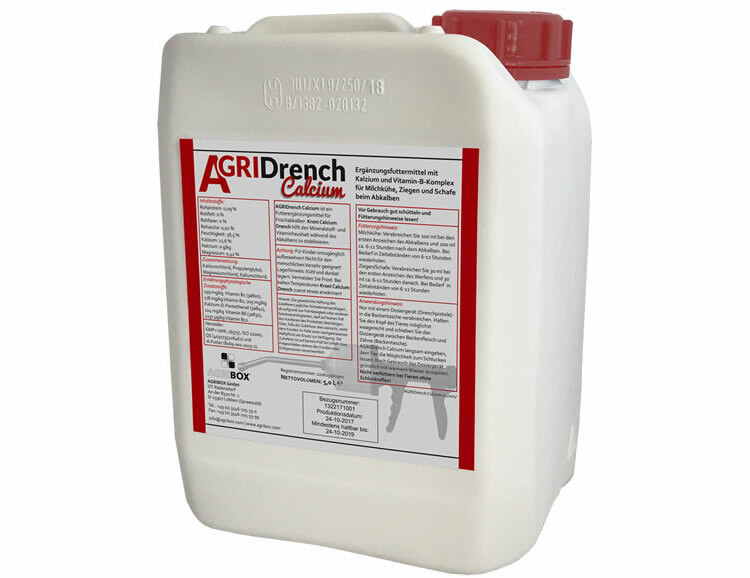 AGRIDrench Calcium is available in 5 liter containers. With the drench method the drenchgun is inserted between the cheeks and the molar teeth into the so-called oral vestibule. This way the solution (AGRIDrench Calcium, AGRIDrench Niacin or CCDrench™) directly flows behind the tongue into the esophagus so the cow cannot taste it. This ensures a stress-free and easy administration of feed supplements to animals.